It's gotta better power-to-weight ratio than a Porsche 911 Turbo S. It charges to 60 mph in just 3.8 seconds from a dead stop. It's gotta big ol' LS7 V8 under-hood. It's the 2013 Chevy Corvette 427 Convertible, the fastest convertible 'Vette ever sold with the bow-tie badge. Prior to today, the closest you could get to owning a new Z06 convertible (without generous application of a sawzall or a well-placed kick to the glued-on roof) was the Grand Sport Convertible, which lacked the Z06's 427-cubic-inch heart. Now they've shoved that engine and a whole lot of go-fast parts into a C6 body to create the 427. 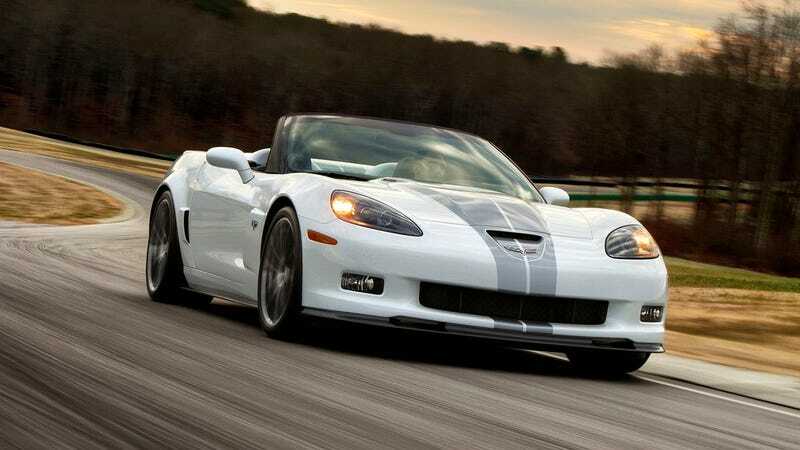 This includes a 505-horsepower LS7 mated to a six-speed manual transmission. Only a manual transmission. Along with the Z06 driveline and rear axle is standard Magnetic Selective Ride Control and a rear-mounted battery. The stock wheel option on the 427 are the 19-/20-inch Cup wheels in Michelin PS2s. Fans of the Z06 will recognize the carbon fiber raised hood from the Z06 Carbon and carbon-fiber Z06 fenders. All of this adds up to a 0-to-60 mph time of 3.8 seconds, a quarter-mile in 11.8 seconds, toupee-pulling lateral acceleration of 1.04 Gs and a top speed above 190 mph. Yes, Corvette is Porsche-ing out with all the special editions as they wait for the impending 2014 Corvette. The latest addition is the Corvette 60th Anniversary Package. Buy a 'Vette this year and you can opt for the Arctic White exterior with a special Blue Diamond leather-wrapped interior with suede touches (convertibles also get a blue top). Other touches include a ZR1-style spoiler, lots of special badging and logos everywhere and full-length racing stripes. This option is also available on the 427 Convertible, which will go under the gavel at the Barrett-Jackson auction later this month, with the money going to the AARP's Drive To End Hunger initiative.